Enormous amounts of email circulate the Internet every day, there can be no doubt about that. But how does the amount of email compare with that of traditional mail, also known as “snail mail”? It would be interesting to know, wouldn’t it? We’ve done the research and done the math, so look no further than the small infographic we’ve put together here below, a comparison of email and snail mail volumes in the United States. The numbers are estimates for 2009, with the one exception being the share of junk snail mail (bulk mail), which is from 2005. Email should-not be compared to snail-mail, but to telephone-calls & faxes. But standards of print are higher than those on the Internet. On this web page we see a large, colorful graphic that reports only *four* data. Since each of these data could easily be represented as a 32-bit number, and the original graphic was 80,265 bytes, I compute that just over 99.96% of this graphic is chartjunk. @Mark: All respect to Tufte, but on the social web it can often make sense to represent data visually. And it doesn’t need to be lots of data to motivate making something visual, colors, size, etc helps a lot. While accurate, these figures are a bit misleading since very little email spam gets delivered nowadays, whereas all the junk snail mail makes it to folks’ mailboxes. 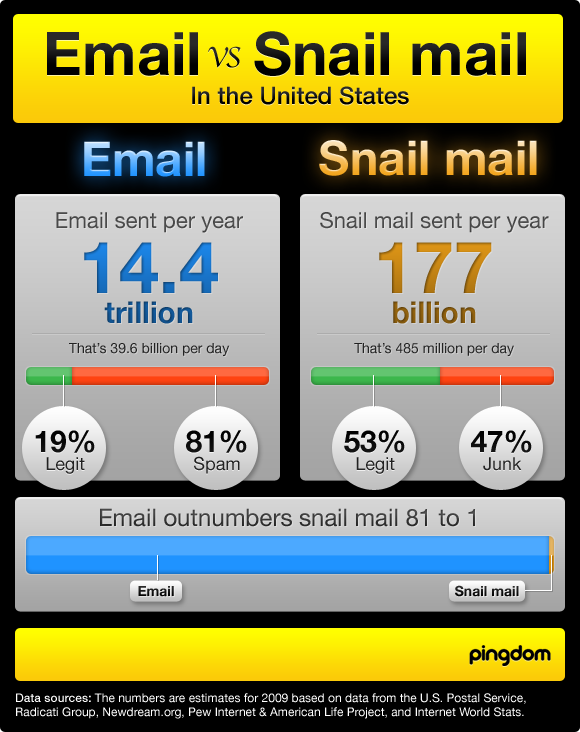 But the overall point is still clear: Email is supplanting snail mail. I cant believe this is just the US!! Divided by the population, thats about 130 messages of spam per day for every single american. Sure take out babies and the elderly, but then add up all the email accounts for everyone in between and I am sure that number is about right. I have 3 web accounts (yahoo, hotmail, gmail) a work account and another professional account. I would say I EASILY empty my spam folders of 100+ messages per day, not to mention all the ones that don’t get caught. But like another commenter said, most of the crap gets caught and I don’t have to look at it, whereas when I walk out to my mailbox and PO Box, I HAVE to deal with every single piece of crap that was sent to me. Whoever figures out to successfully rid the world of spam should win a nobel prize, get a free trip on virgin galactic, and be provided a lifetime supply of SPAM. The comparison is worthless. Snail mail still has its place even if there are a million times more e-mails. I cannot receive ATM cards or credit cards by e-mail. I can carry a printed magazine with me but I must lug hardware to carry an e-zine. I can display printed greeting cards on my counter but not e-cards. (They aren’t formatted to be printed as a folded card.) Despite the Electronic Signatures in Global and National Commerce Act, almost all legal situations still require ink signatures on printed documents. Interesting graphic, although 81:1 is an unhelpful statistic since it counts spam communication. If we calculate the ratio again, this time with spam removed, the ratio is about 29:1, which is a very impressive number. How did you do this research? I want to use it in a speech but I want to know that it is credible and legit before I quote it. @Kay: The data sources are in the infographic. Interesting graphic with very impressive numbers! Still, that’s 90+ Billion of legit snail mail for a year is good enough nos for the postal service to continue operation in spite of having e-mail. How can we get these to equal out a little more. Why is there so much email spam???? How annoying!